216 Hanging Horse – $510,000. 4 Bedroom • 3.5 Bath • 5058 s.f. 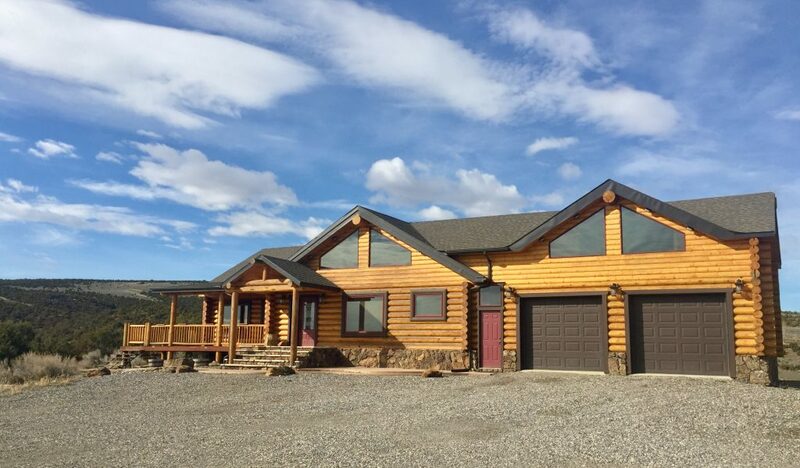 Property Highlights : This Beautiful Custom Built Log Home is surrounded by 360 degrees of gorgeous views. 4 Bedroom, 3.5 Bath, Attached Double Car Garage. Plenty of elbow room with 7.5 acres. All within minutes of town. MAIN LEVEL: Living room, kitchen, dining room, master bedroom, master bath and 1/2 bath. BASEMENT: family room, laundry, 3 bedrooms and a full bath. HEATING/AIR CONDITIONING: Gas forced air, wall evaporative cooler. OUTSIDE: 7.5 acres, partially landscaped, wrap around partially covered deck, spectacular views.